The walls of the cave temples were plastered with sand, hemp fiber, and mud then painted. Interior wall of Cave 275, Northern Liang Dynasty (420-429 CE) (Dunhuang Academy). The cave temples of Mogao at Dunhuang, Western China, are carved into the cliff face along the Daquan River and are surrounded by austere desert (Sun Zhijun/Getty Museum). What can rock, mud, animals, and plants tell us about the Buddhist cave temples of Dunhuang? 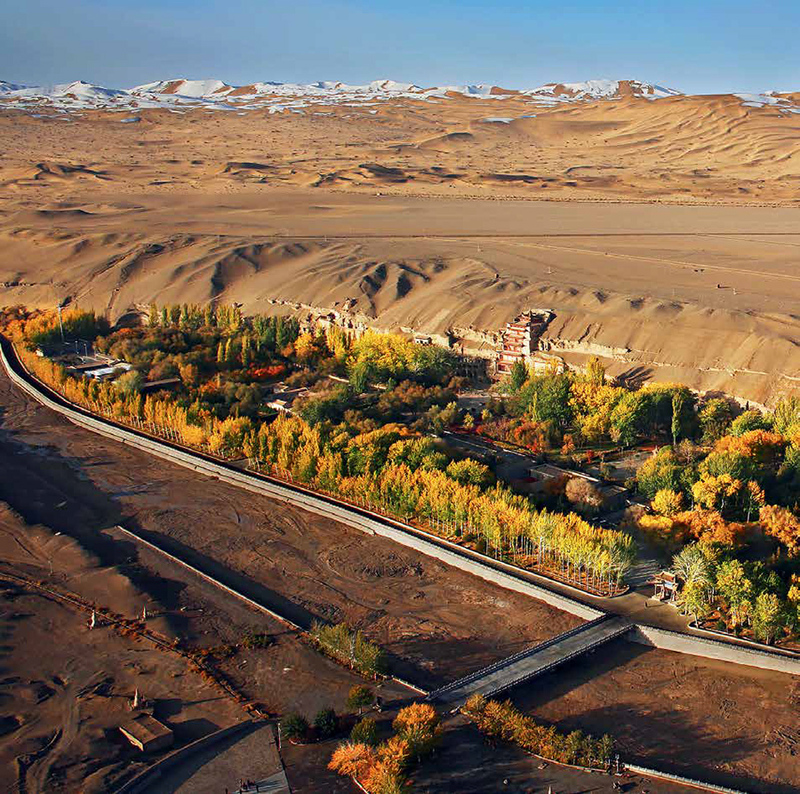 The Mogao cave temples of Dunhuang have been shaped by more than the Buddhist artists and builders who crafted the site over the course of a thousand years -- the environment itself has played a vital role. After several decades of research and conservation work carried out by the Dunhuang Academy in collaboration with the Getty Conservation Institute and others, we now have a greater understanding of how the natural setting and local climate -- from the wind and the desert sand to the water sources nearby -- influenced the design of the cave temples and their paintings. 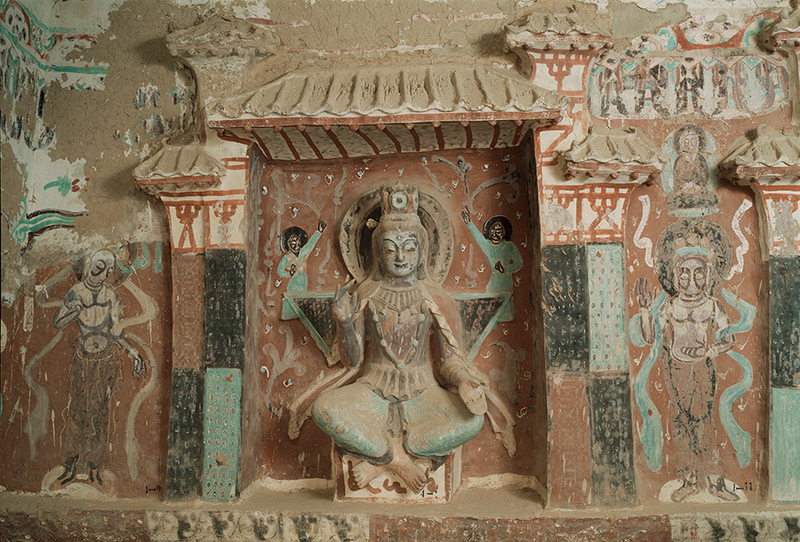 The overall configuration of the Mogao Grottoes is key to understanding the relationship between its art and environment. Nearly five hundred extant caves are distributed over a half-mile along the same cliff face in the southern tip of the Sanwei Mountains. The heavy concentration of cave-building activity in this relatively limited area from the fourth to the fourteenth centuries underscores the remarkable allure that the place held for the local community. Aerial view of the Mogao Grottoes showing the location of the cave temples in the cliff face. Poplar and conifer trees provide shade for the site. Beyond the sandy expanse above the cliff rise the dunes known as the Mingsha Shan, capped with snow. Courtesy of the Dunhuang Academy (Sun Zhijun). In material terms, the rock structure is the same for most of the temples, and the general climate is consistent throughout the site. Composed of conglomerate, a soft rock, the cliff was easily excavated with hammers and chisels, and the cave temple walls were plastered with sand, hemp fiber, and mud from the nearby Daquan riverbed before being painted. Despite working in the same location, different generations of builders and painters dealt with these existing environmental conditions in disparate ways. When all the available cliff surfaces ran out in the tenth century, however, the need to reconfigure the site anew arose. Builders added many monumental cave temples by consolidating older units into one location, and they consulted the work of their predecessors while carrying out this renovation. Their awareness of Dunhuang’s history of construction and adaptation enabled them to better respond to the immediate environmental pressures. 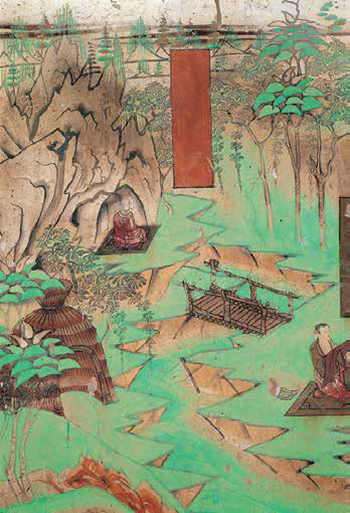 Greenery abounds in this landscape illustrating the Maitreya Sutra. Detail, north wall, Yulin Cave 25. Late eighth-early ninth century (Dunhuang Academy). In addition to the physical setting, the mural paintings inside the cave temples at Mogao offer ways to chart the shifting ecology of the area. Take, for example, representations of plants and animals. These paintings could be a source of information regarding environmental changes over time. Although most of the scenes depicted at Mogao pertain to imaginary realms populated with Buddhist deities of all sorts, local painters often imbued these religious scenes with a touch of reality from their own earthly lives.